Join Your Grandchildren in the Fight Against Bullying! - Grand . Join Your Grandchildren in the Fight Against Bullying! Sadly, bullying has become a problem of epidemic proportions for kids everywhere due to new technology and the ability to go viral with the click of a button. If you it was bad when you were a kid, imagine what it’s like now with Facebook, YouTube, and other social media outlets! Well, we think enough is enough. It’s time to do something about it…one t-shirt at a time! You don’t have to be a student, parent, teacher or even a celebrity to get involved in anti-bullying campaigns – you just have to put on a shirt! 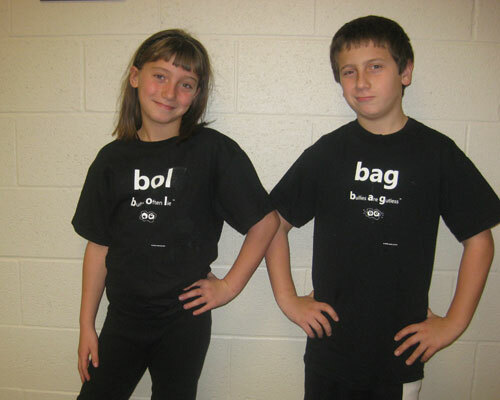 Shout b cause, LLC, just launched a new anti-bullying campaign featuring “no bully txt” shirts. 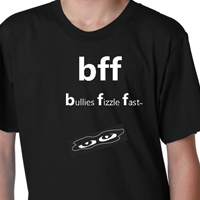 Each shirt displays a recognizable text abbreviation, like “bff” or “btw” (best friends forever, by the way), redefined to battle bullies in school across the country and around the world. “Bff” has been redefined to be “bullies fizzle fast,” and “btw” to now mean “bullying that’s weak,” so that teens everywhere can communicate a strong, anti-bullying message through familiar texting acronyms! Each shirt design also features a unique, spineless “Bully Blob™” graphic reflecting the new definition. For schools, governments, and corporations inspired to distribute the shirts to local students, they can have custom colored shirts and their logo imprinted on the sleeve. So stand up, speak up, make sure you’re talking about it! Let your grandkids know that you’re someone they can go to if they are being bullied or just need someone to talk to. Let’s make anti-bullying the new cool and get a rapid fire movement going across the country, one t-shirt at a time! Your purchase will help support anti-bullying with a portion of the proceeds donated to non-profit anti-bullying organizations. 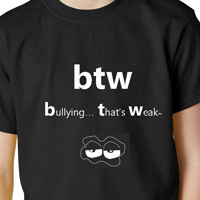 For more information about the T Shirts and to get involved, visit www.nobullytxt.com. Your Grandchild – Safe Around Water?